Bitman Comedy & Show Prep | The Superhero of Show Prep! The Superhero of Show Prep! The Bitman Comedy and Show Prep Service was launched in 1990 by David Evjen. 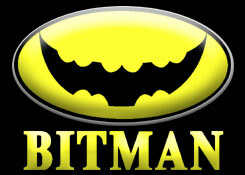 Armed with an Apple II C computer, a dot matrix printer and a fax machine, Bitman started as a one page joke sheet. Over the years, Bitman has grown into a complete prep sheet of 25-40 pages of quality, usable material daily. Along with jokes, subscribers get celebrity gossip, Hollywood news, the latest updates on music artists, sports and more! In addition to working on the air in great bay areas such as Monterey, Tampa and San Francisco, David has written for the likes of Jay Leno and David Letterman. For free samples, contact Ralph Riley at United Stations Radio Network at 212-869-1111 or ralphriley@unitedstations.com and tell him you want to take a Bitman test drive!